The T-1 Inoculator allows for the quick and safe vaccination of reticent populations. 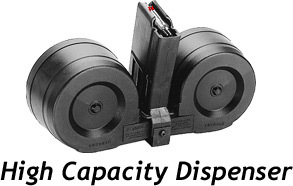 The D-100 high capacity magazine and accompanying quick-release C02 canisters increase the rapid distribution of medication while reducing risk to personnel in small to medium populations. The disposable, 14 gauge needle, darts are designed to provide precise drug delivery in a convenient, inexpensive projectile. 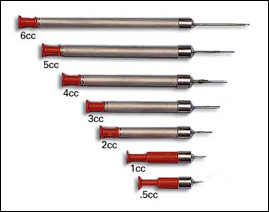 These darts are graduated in size and needle lengths for use on populations of varying average weights. An ordinary 1cc dart will typically bounce off the patient. However, our injections are completed with the assistance of a small explosive charge that detonates on impact and quickly injects the drug. The dart will flash when the explosive detonates, verifying target acquisition in poor light or shadows.